Looking to set up and deploy a virtual machine of Windows 7, Windows 8.1 and/or Windows 10 quickly? Microsoft has various virtual machines running either Windows 7, Windows 8.1 or Windows 10 available for free download. These virtual machines, when opened or imported into a compatible virtualization software, can be booted up without any further configuration for instant usage of Windows operating system. 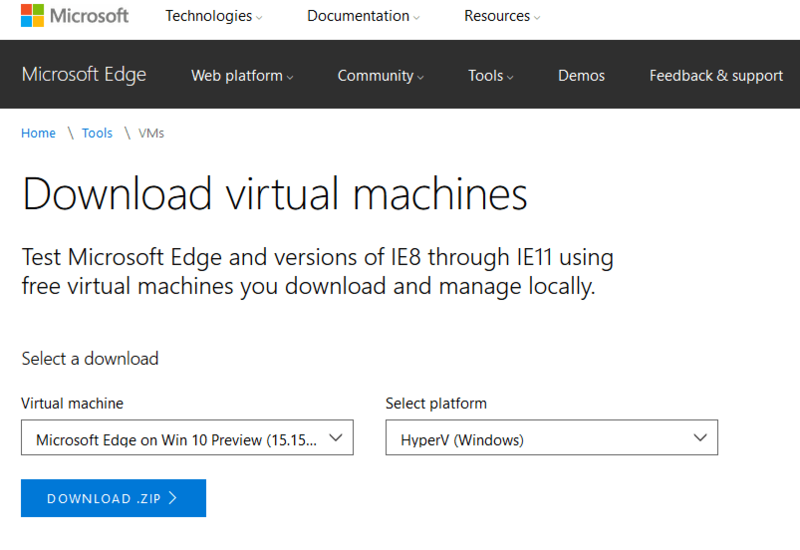 The main purpose for Microsoft to provide the VMs of various Windows operating systems for free download is for web developers to test their sites on Microsoft Edge and versions of IE8 (Internet Explorer 8) through IE11 (Internet Explorer 11). These versions of Microsoft Edge and Internet Explorer web browsers are available in different versions of Windows OS, hence Windows 7, Windows 8.1 and Windows 10 VMs are made available for free download. The list of images supported will change as new version of Microsoft Edge and Windows OS available. For example, previously one of the images available is IE6 on Windows XP, which no longer available now. Download the free Windows virtual machines from https://developer.microsoft.com/microsoft-edge/tools/vms/. The download is in ZIP package, which should be extracted to reveal the virtual machine configuration file and virtual hard disk that can be opened by supported virtualization platform. Though the virtual machines are free and pre-activated (no product key is required), one caveat is that these virtual machines expire after 90 days. If you intend to continue using the virtual machine for more than 90 days, Microsoft recommendes that you take a snapshot or checkpoint when you first install the virtual machine which you can roll back to later. It also means that you cannot save any data inside the virtual machine or risk losing when you go back to earlier snapshot.